Funding requested to begin building the planned Dwight D. Eisenhower memorial near the National Mall has been eliminated in a spending deal passed by Congress, while lawmakers restored funding for other national arts and cultural programs. In total, Congress approved more than $1.3 billion this week for various arts agencies in the $1.1 trillion spending bill. 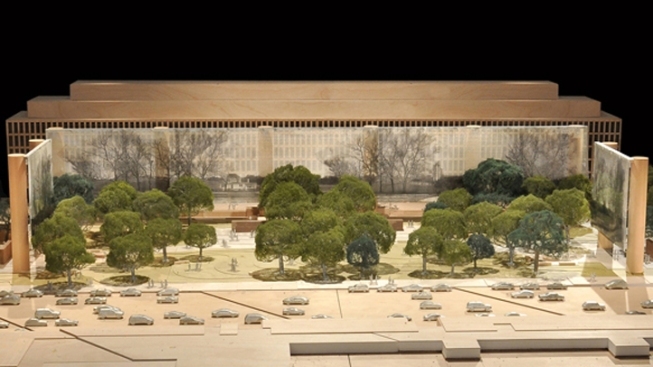 The Eisenhower project, though, had minimal support amid an ongoing dispute over architect Frank Gehry's design that has delayed the project for two years. Lawmakers approved $1 million for salaries and expenses to sustain the memorial commission's operations, but lawmakers dismissed the commission's $49 million budget request for construction. Language in the spending bill challenges the memorial project to resolve differences before moving forward. Eisenhower's family has objected to the design and called for a simple memorial. "The committees urge the commission to work with all constituencies--including Congress and the Eisenhower family--as partners in the planning and design process,'' the bill reads in part. Senators from Eisenhower's home state of Kansas are leading the memorial effort with other lawmakers and presidential appointees on the federal commission. Commission spokeswoman Chris Cimko said the project is still seeking design approvals this year from two federal panels before construction could begin. Lawmakers also challenged memorial planners to detail their private fundraising for the project in their next funding request sent to Congress. The commission has begun working to raise private money to help fund the project, but officials declined to say how much has been raised so far. Some in Congress may want to know how many people believe in the memorial and are willing to support it financially, Cimko said. But some donors want to wait until the project's design is approved, she said. Other arts agencies would see funding restored as Congress eased automatic budget cuts that took effect in 2013. The deal provides $805 million for the Smithsonian Institution, the largest arts and culture account, restoring $30 million that was cut last year. If automatic funding cuts had continued, museum officials were facing decisions on whether to furlough employees and close museums some days of the week. Congress fully funded the Smithsonian's request of $55 million to continue building the new National Museum of African American History and Culture. Still, this year's funding is below the $810 million the Smithsonian received for 2012. The National Endowment for the Arts and the National Endowment for the Humanities, which fund arts programs nationwide, will see funding restored to 2012 levels under the budget deal. Both agencies will receive about $146 million this fiscal year--about $7.6 million more for each agency than last year. Still, this year's funding is about $21.5 million less for each agency than the 10-year funding high point in 2010. The 2014 spending bill is pending President Barack Obama's signature. He is expected to sign the bill into law before Sunday.